Join Globe Salon for a Holiday Party + Toy Drive, December 2! Join Globe Salon for a Holiday Party Dec 2! • Wear a Holiday Sweater — Get a FREE DRINK! • Bring an Unwrapped New Toy — Get a FREE DRINK! 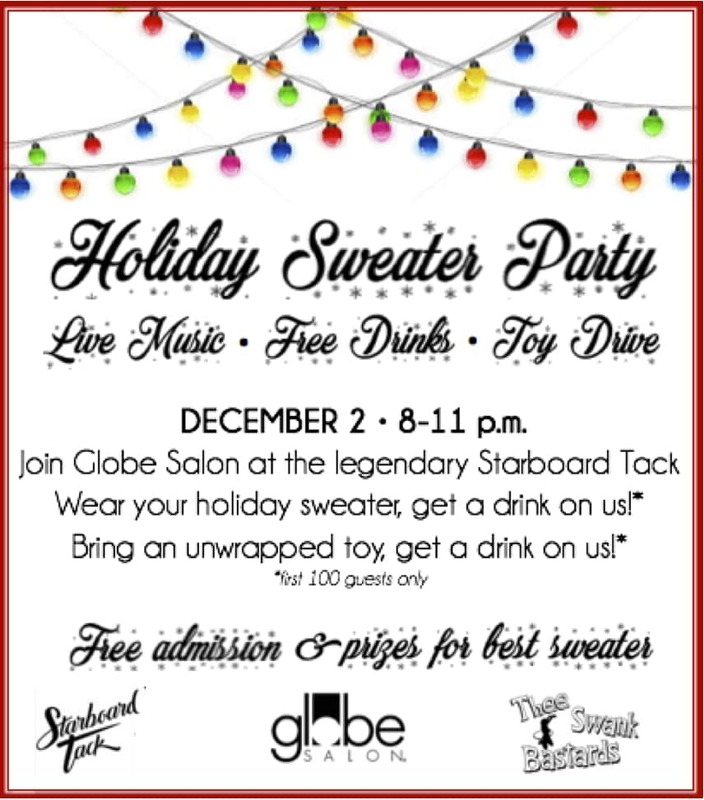 On Saturday, December 2, 2017 from 8–11pm, the public is invited to join Globe Salon friends and family at the Starboard Tack (2601 Atlantic St, 702-684-5769) for a holiday party for a cause. The award-winning, locally-owned hair salon will be jump starting the spirit of the season with a holiday sweater theme: Wear your favorite festive, funny or straight-up ugly holiday sweater and get a drink on us! Bring an unwrapped toy for donation to the 19th Annual 98.5 KLUC Chet Buchanan Show Toy Drive and have yourself another drink. Free drinks are limited, so guests are encouraged to arrive early. Thee Swank Bastards — a dapper dressed, Las Vegas-based surf rock ensemble — will perform live at 8:30 and 10 p.m. There will be prizes for the best holiday sweater, including a $150 gift card to the Hard Rock Hotel, courtesy of an anonymous donor. Starboard Tack is a legendary Las Vegas tavern, originally opened in 1971. A popular hangout for entertainers, casino workers, and Vegas socialites, the bar was recently rebooted thanks to the efforts of Downtown craft bartenders Bryant Jane and Lyle Cervenka, and features an impressive menu of craft cocktails and food. Globe Salon is located at 900 Las Vegas Blvd South, Suite 130, in the Soho Lofts in the Las Vegas Arts District. The telephone number is 702-938-4247.